Dr Tom Lewis, OAM; Illustrations by Michael Claringbould; Softcover; 250 x 176mm; 208 pages; full colour throughout; 2017. Very few Australians today know of the fierce air battles fought across the Top End of Australia in World War II. For more than two years Japanese aircraft crossed the coast and bombed relentlessly. Savage dogfights were fought between the legendary Zero fighter and Allied Kittyhawks and Spitfires. Big twin-engine Betty bombers rained down blast and fire upon airfields and towns, even penetrating as far inland as Katherine, some 300 kilometres from the coast. Nearly 200 Japanese aircrew died in the onslaught. This book lists all of their names and describes all of the combat missions – and reveals for the first time that the number of combat flights, aircraft shot down, and aircrew who died is far higher than previously thought. Scores of aircraft were downed in combat operations ranging from Exmouth to Townsville, with the majority of action taking place in the Northern Territory. This new extensive research shows the number of air raids was higher than the previously suggested figure of 64, with 77 raids on the Territory alone, while 208 enemy combat flights were carried out across Northern Australia. 186 Japanese airmen died when their aircraft were brought down. In many cases their bodies lie in remote sites across the vast bush and coastal waters of the north. Many of the wrecks have never been found. The Empire Strikes South describes all of the aircraft used, and gives an insight into the world of fighter pilots and aircrew. With a full range of new colour graphics by renowned illustrator Michael Claringbould, this significant new research reveals a battle for Australia that has been previously unknown. 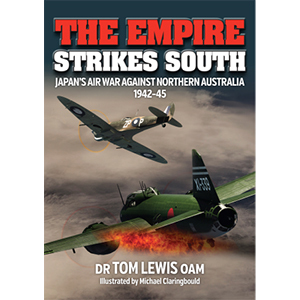 About the author: Dr Tom Lewis OAM is Darwin-based military historian. He is a former naval officer and the award-winning author of 14 military history books.